Theater is the ultimate (and original) reality show, even though the cast, crew, and director are using scripts. Let me tell you the story of the corpse who corpsed. An actress, she was playing a dead body in a scene so comic the audience was in stitches. But it wasn’t the laughter that caused her to corpse (the theatrical term for “cracking up”). She was ticklish in the place where one of the other actors was holding on to her at the time. “I tried everything,” she told us later. “I really concentrated, I counted backwards: nothing worked.” I’m withholding her name and role because at the time we talked she didn’t know I was a journalist, and I don’t want to embarrass her. That's the conundrum of great theater. The highlights of seeing a live play for the audience are sometimes the very things that pain the performers. While audiences appreciate great acting, they also enjoy the moments when actors become accessibly human right there in real time. Actors, meanwhile, are all about professionalism and staying in character, even in plays that by their particular staging conventions encourage audience interpolations, such as the play we saw last night in a New York City parking lot or the productions at the American Shakespeare Center's Blackfriars Playhouse in Staunton, Va., with its universal lighting and the audience hemming—and even on—the stage. Yet, it is in that middle space, between the actor's attempt to deliver a character perfectly and the audience knowing that imperfection is inevitable, that live theater resides. The more inevitable imperfection seems to be—seems being an operative word here—the more vital theater becomes. And it is such vitality that puts live theater in a perfect position to capture a generation of gamers and Tweeters, many of whom feed on a life lived at the edge of the unknown. Theater is a living organism, malleable in its moment, the only nonsport entertainment and art form to be so, other than music. Only video games give an audience more occasions for spontaneous happenstances per viewing. Theater is the ultimate (and original) reality show, even though the cast, crew, and director are using scripts. By contrast, “reality TV” is a carefully predicated and edited product delivered to its audience in a nonmalleable form. Cinema and theater are related in that both rely on actors, production artists, and scripts, and both share a public forum for presentation: a theater. But the only time cinema becomes malleable for the audience is when the projectionist screws up—seldom a highlight of the event. Hollywood is trying all sorts of gimmickry to make its product seem more living, the latest being 3D, which, in many cases (usually because it’s not done well) makes for an even more detached experience. A few weeks ago, I passed a personal milestone: I attended my 300th stage production of Shakespeare plays or adaptations (I've seen a total of 460 theatrical productions). This doesn't include filmed versions of the plays. At the top of the list of plays seen—though not heading my list of favorite plays—are Romeo and Juliet (20 times), A Midsummer Night's Dream (20), Twelfth Night (18), Hamlet (15), and The Comedy of Errors (15). Many people are astonished that I would see Romeo and Juliet 20 times, but I know lots of teens who saw Titanic that many times and more—the exact same Titanic every time, too—and Star Wars fans need slide rules to compute the number of times they've seen every film and their mutations in that series. Yet, every single Romeo and Juliet I've seen is a mutation of Shakespeare's original: No two productions are conceived alike, no two portrayals of each character is alike, and, in varying degrees, no two performances of the same production are alike (that 460 productions I've seen does not include the few times I've attended the same production more than once). At the least, the actor's experience is greater from performance to performance while each audience is its own unique self. Human endeavor is rarely replicated, and even though actors memorize a script and rehearse every minute movement, it's still live theater, and life happens when it's live. The degrees of "live" depend on venue and directorial style. Many directors present a cinematic experience with live actors, where only the popcorn is missing. The players perform on a detailed set with a taped soundtrack up there on stage while we the audience sit down here in our seats, and never the twain shall meet physically; they may share emotional or artistic connection, but no eye contact. At the opposite end of the spectrum is Taffety Punk's Bootleg Shakespeare, in which the Washington, D.C., company gathers a cast that, with lines memorized, meet for the first time in the morning and present the play to the public that evening for a single performance; certainly, even with lines memorized, staging a play with only one rehearsal guarantees that real life happens on that stage. Furthermore, in that performance, the actors move through the audience, speak lines directly to people in the audience, and respond directly or discreetly to audience reactions. Having attended 460 staged productions, I have never seen an audience so abuzz before the play began than I witnessed at Taffety Punk's Bootleg Love's Labour's Lost last week. And what theater doesn't want buzz? 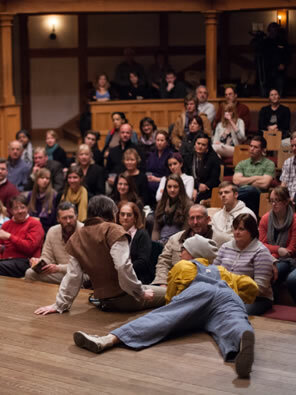 It is not ironic, though, that the model for interactive live theater is Shakespeare. He wrote the bulk of his plays knowing they would earn money for his company, the King's Men, by how well they played to the rowdy, much illiterate audiences at the public playhouses or in the taverns and market squares that the actors hit on their provincial tours. In the King's Men's more elite indoor theater at the Blackfriars, the audience sat on the stage and in the gallery that served as the upper-level play space. And if the behavior of the nobles watching the performances of Pyramus and Thisbe in A Midsummer Night's Dream and the Nine Worthies in Love's Labour's Lost is an accurate depiction, even the audiences at Elizabethan court performances would have intruded on the plays. This understanding rides intuitively through Shakespeare's works. Several times, actors who play at the replica Blackfriars in Staunton, which uses King's Men staging conditions, have told me how an audience member's response to a line or situation miraculously, it seems, rides right into the next line in the script—no ad lib necessary. But do the X and Millennial generations, so into new technologies, want something so old and literate as Shakespeare on a bare stage or in the middle of a parking lot? The real irony is that Shakespeare and his Elizabethan/Jacobean colleagues have more in common with Will Farrell, Judd Apatow, Seth McFarlane, James Wan, and Joss Whedon than with, well, the distal Shakespeare we've come to know through 400 years of scholarship and worship, 300 years of proscenium arch presentations, 200 years of highly stylized directorial conceptualization and control, and 100 years of competition from the cinema. I can't count the number of times I've seen "I can't believe he said that" expressions at a Shakespeare play, and modern slasher films have nothing on Titus Andronicus. In form and content, then, Shakespeare—the great Renaissance writer—is poised to lead the way to a new theater renaissance. Many theaters are consternated over their "aging audience" and subsequent dwindling revenue, so they amp up their begging while rolling out the same self-centered product. In my experience, it's not the art form that's aging but the delivery of that art form that's growing musty. I can't quote box office numbers, but I can attest to the younger-skewing crowds we see at ASC's Blackfriars and other similar accessible-to-the-action playing spaces (whether it's no-fourth-wall playhouses or castle ruins, New York City monuments, park lawns, or parking lots). I can attest to these young adults' excitement before and during the shows. I can attest to their involvement in both the plot and the language, too. Give these younger audiences some skilled actors on a platform performing a good Shakespearean script with the audience rather than to the audience, and you've tapped into the social psyche of a generation that embraces an anything-can-happen spirit and believes it's all about them. True, it's not a wealthy age group but, on the one hand, they will spend money on cool, and on the other they are not indulging in the trappings of theater but the personal experience of theater. I don't advocate unemployment of set designers, but simpler or thematically daring sets, instead of the elaborate scenery I've seen in many a big-budget playhouse, not only can lead to more engaging theater but more cost-efficient theater, too. Seriously, I have wondered how much of my ticket price or annual donation went into that oversized staircase in the middle of the stage where it obstructs the flow of action, causes a crick in my neck, and imperils the lives of high-heeled actresses. I admit, a street-scene set may look awesome in its detail; very like a movie, in fact. But I can get that in a movie at half the ticket price. Now, if the movie were like The Purple Rose of Cairo where the actors actually notice you are there and might even come down from their domain to connect with yours, that would be worth any price of admission. But, of course, The Purple Rose of Cairo was fiction. Live theater, though, is real.